When Outlast released on PC last year, it was met with respectable praise but received little commercial success. 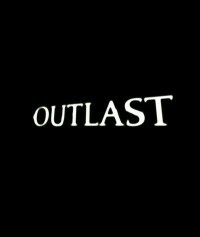 Although it was advertised that its creators were former members of a range teams which include Prince of Persia, Splinter Cell, Assassin’s Creed, and Uncharted, there was still not much of a platform for Outlast to stand upon. Now, the thriller comes to the PlayStation 4 at the price of $19.99—or, if you are a member of PlayStation Plus, it launches at the best price of all: free. This spooky, free-to-play game chronicles a journalist named Miles Upshur as he journeys to Mount Massive Asylum. From the moment the game begins, you realize that things at the Asylum are not quite what they seem. 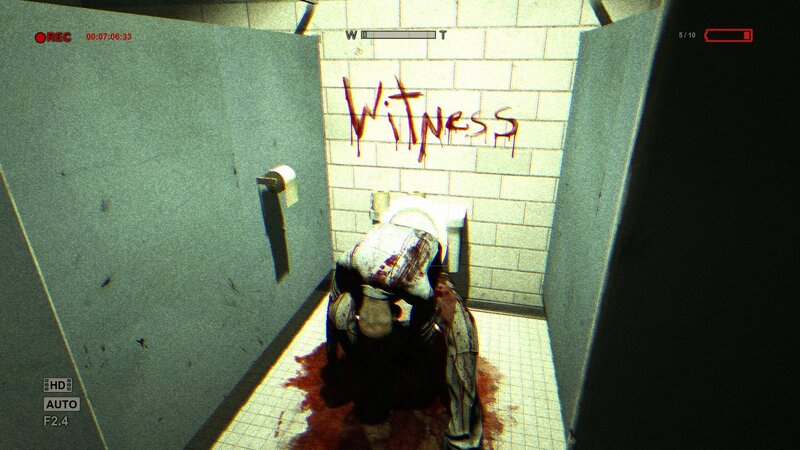 Early on, you become witness to blood spattered on the wall, bodies impaled on stakes, and weird, cryptic messages telling you “THEY LIE” and to “WITNESS”—amongst other creepy things. Equipped with only a video camera and some batteries, you embark on an eerie journey to document what you see, investigate what remains, and hopefully get to the bottom of this sinister mystery. Upshur’s visit to Mount Massive Asylum is legitimately scary. If you are looking for a survival horror game that moves beyond gritty action and into true survival, this game is right up your alley. As you start to uncover some of the secrets of the Asylum, you run into Father Martin, who believes Upshur has been sent by Divine Providence to document his cult and his ministry’s rise. In time, you begin to learn that these religious overtones are not separated from the general setting of the Asylum. You see pictures of parish priests on the walls, usually smattered with blood, and hear creepy mantras or prayers deep in the halls. You realize early on, however, that these freaks who haunt the halls of the Asylum are not your typical ghouls—they are test subjects. 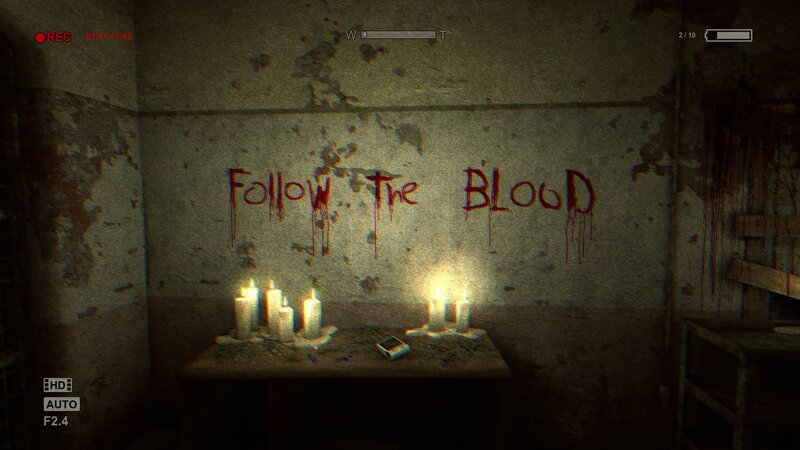 Although the gameplay in Outlast is simple, it is surprisingly effective. Equipped with only a video camera, this first-person game makes you literally hide-and-seek as you are stalked and hunted through the halls of the Asylum. Your camera has two modes: regular and night vision. A large portion of the game is crawling alone in the dark, trying to stay hidden from the test subjects, and sometimes night vision is the only way you can see a thing. Your goal is to document what you see, so you have to frequently record segments and various things you “witness.” When you see something particularly interesting, the camera will automatically create a note making sense of the happenings in the Asylum. Beyond that, you will find documents that begin to explain the great mystery: What is going on here? Eventually, you discover the test subjects are the amiss results of something called MKULTRA. 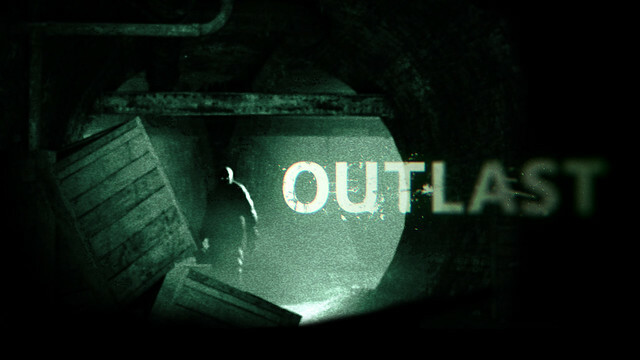 Based on the actual Project MKULTRA experiments performed by the U.S. government in the 1950s, Outlast does a particularly good job of blending reality and fantasy. While there is no record of any zombified enemies resulting from the experiments, every now and then you’ll get a glimpse into what might have actually gone down in the shadows of the past. The intrigue is strong enough to keep you interested and want to see what happens next. But truly, and I cannot stress this enough, this game is terrifying, and it will be a hard play through on any difficulty. Most of the time, slinking in the dark, you are trying to escape your predators. And with no weapons or armor, there’s really no way for you to fight back. But unlike these mind-controlled subjects, you have your wits about you. Because of this, you can usually escape their grasp just quickly enough to evade and outlast them. You might hide under desks, hide in lockers, look for vents to climb into, or just run away and hope you don’t find another one down the next hall. You also have to hunt for batteries to make sure your only real cloak in the darkness, your video camera, does not run out. The atmosphere, both technically and artistically, is sufficient in the sense that it paints an arena that will grab you from the get-go and, until the credits roll, make you want to “outlast” your environment. Even if you don’t have PlayStation Plus, the $19.99 price tag really is easy to justify. It’s not a terribly long game, and there is not much to do after you beat it, but it’s memorable and exciting enough to warrant another playthrough. On the other hand, if you are a PlayStation Plus member, what would possibly stop you? Again, this game is actually scary. It’s the kind of game that you only want to play in short bursts precisely because the intensity levels are so high that it’s like an adrenaline shot every time. If you can stomach the fear and get into the zone, you’ll find there is a very compelling and rewarding narrative that is satisfying any way you spin it. 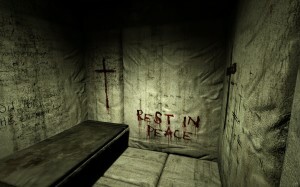 Are there problems with Outlast? Maybe. It depends on what you are looking for. Some of the A.I. is a little dumb, but because you’ll be fearing for your life whilst trying to survive, you’re going to grow to appreciate a little relief. Even with some cheap scares, the overall atmosphere of the game is so startling darkened that it will beg you to come back in and keep playing. Trenching further into the darkness that is Mount Massive Asylum is a daunting task, indeed. Not since Amnesia: Descent into Darkness has there been a survival horror game so unique. Whether you are exploring free of your camera, using it to record, or to simply see in the dark, you are going to want to discover what bellows deep underground and finally uncover what it is you are up against. Even if you are not as interested in the story, the real-life throwback to the MKULTRA experiments of the past is an interesting and welcome touch. Ultimately, it is this surprising twist on the mind-control plot device which makes things from the real world stand out in the game world. As you will see, Father Martin wants you to witness his cult’s rise. But, the real question is whether or not you can outlast this terrifying descent into the madness of Mount Massive Asylum. It might not blow you away on any technical level, and it surely isn’t a blockbuster or killer app, but Outlast is a uniquely terrifying game worth a play. It’s short, it’s scary, and in its own unusual way, it’s fun. And, above all, it’s free. Hopefully this time it will reach a wider audience. Given the slim pickings on the PlayStation 4, it would seem strange for someone to skip out on this title unless, of course, they are afraid. The reviewer acquired the game at no charge on the PS4 via PlayStation Plus.